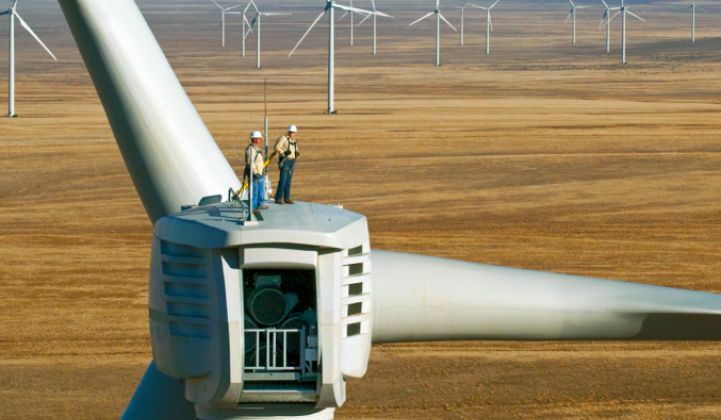 SunEdison is now in the wind project business in a big way. SunEdison and its YieldCo TerraForm just acquired wind developer First Wind for $2.4 billion. It means SunEdison is in the wind business and can now add wind projects to the solar project pipeline of its YieldCo, TerraForm. The purchase price consisted of $1.9 billion in an upfront payment and a $510 million earn-out. First Wind is backed by DE Shaw and Madison Dearborn Capital Partners. GTM Research analyst Cory Honeyman points out that First Wind currently ranks as the 11th largest utility-scale PV developer in the U.S, with a total of 468 megawatts (DC) in operation and in development, according to GTM Research's U.S. Utility PV Market Tracker. This makes SunEdison one of the world's largest, if not the largest, renewable energy developers. Honeyman notes that First Wind has "made a name for itself by tapping into unsaturated state markets for utility-scale PV, most notably Utah and Hawaii. The developer's recent wins in Utah highlight one of the key trends defining the utility-scale market in 2014: a growing number of projects are being procured by utilities outside of RPS standards." He adds, "Yingli has been one of First Wind's primary suppliers of modules to date, most notably for the developer's large-scale 80-megawatt projects in Utah." "First Wind is one of several developers with a longstanding focus on wind development that has recently shifted gears toward solar. In the past twelve months, former wind-driven developers have secured nearly 900 megawatts' worth of new utility-scale PV PPAs," notes the analyst. Jigar Shah, the founder of SunEdison, tells GTM, "Access to low-cost capital is a huge strategic advantage today. First Wind needs access to this capital, and this transaction shows that SunEdison has more credibility on YieldCos and low-cost capital than anyone." YieldCo TerraForm will be acquiring 521 megawatts of active wind and solar power plants. SunEdison will acquire more than "1.6 gigawatts of pipeline and backlog, adding to TerraForm Power's call right project list." These projects are expected to be operational in 2016 to 2017. As per the release, "Pro forma for the transaction, TerraForm Power raises its 2015 CAFD guidance to $214 million and 2015 dividend guidance to $1.30 per share." First Wind has more than 200 employees, with wind and solar projects (mostly wind) across the U.S. The release notes that the acquisition adds 8 gigawatts of pipeline and backlog. SunEdison raised its 2015 installation guidance from 1.6 gigawatts to 1.8 gigawatts to 2.1 gigawatts to 2.3 gigawatts as a result of the acquisition. A colleague close to First Wind notes that in addition to its wind and solar project pipeline, First Wind has experience with expanding transmission lines, energy storage in Hawaii and new wind technology that allows harvesting power from lower wind speeds. GTM Research's Honeyman suggests that the acquisition brings up two important implications about the role of YieldCos in utility-scale solar. YieldCos represent an attractive exit strategy for pure-play solar developers before the federal ITC drops: Seven of the top twenty utility-scale developers are considered "pure-play" developers, meaning that none of them own their assets in the long term. With the ITC drop-off looming at the end of 2016, margins for pure-play developers are expected only to grow thinner (see David Crane's assertion about such developers with "bargain-basement bids" for solar PV). Making the switch from selling projects at or near commercial operation to selling the company altogether to long-term PV asset owners represents an attractive strategy for pure-play developers, in what should be an increasingly consolidated developer landscape beyond 2016. Can a YieldCo survive on utility-scale PV alone? Apparently not, according to SunEdison: Until this acquisition, TerraForm was the only YieldCo fueled exclusively by solar PV assets. There have been hints that SunEdison would consider diversifying TerraForm beyond solar PV for the past several months, and this acquisition further validates the case that a YieldCo vehicle's long-term viability requires a diversified resource generation mix beyond just solar PV.